An integrated community which brings together busy working people, freedom loving home makers and independent senior citizens by offering them the right facilities and services thereby contributing to a vibrant, richer and more fulfilling lifestyle. 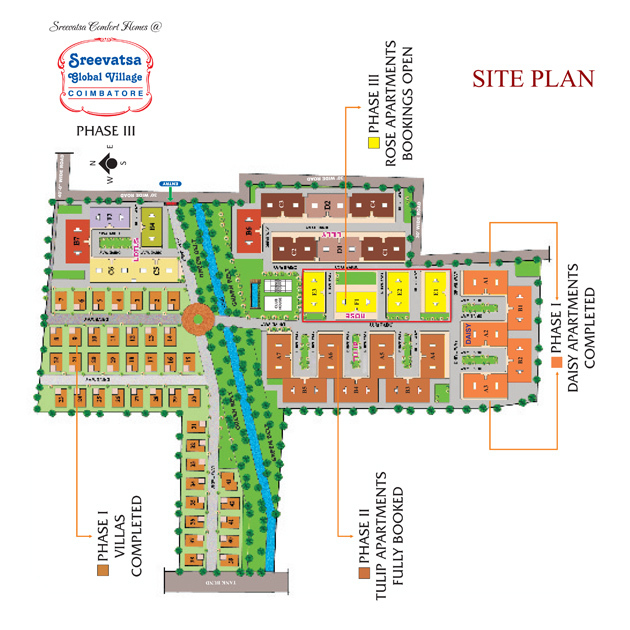 Sreevatsa Global Village is a gated community coming up on 20 acres of land at Saravanampatti, Coimbatore. Phase I comprising of 43 villas and 80 luxury apartments has been fully booked and is fast nearing completion, Phase II comprising of 112 luxury appartment also been fully booked and constructions is under progress. We are happy to inform the launch of Phase IV Global Village with 112 luxury 3 bedroom apartments. Freedom from daily chores for the busy bee. Sreevatsa homes can help you make more time for yourself by freeing you from several hassles. Our infrastructure, amenities and services will help you plan and devote time for yourselves and achieve a healthy and event filled life.